If you’ve ever dreamt of seeing wildlife on a safari, and have the money to spend on that once in a lifetime trip, there’s probably one reason why you haven’t done it yet – you don’t want to ‘rough it’ in a tent. Thankfully, safaris have come a long way since the days of basic tents and ropey hotels, and now more safari destinations than ever are catering to luxury travelers looking for five star accommodation, decent food and breath-taking sights of wildlife in their nartural habitat.. The rise of honeymooners choosing luxury safaris over a traditional relaxing beach breaks have also forced standards of safari destinations up a grade. There are several ways to do a luxury safari. Firstly, there are luxury safari lodges. These normally boast the best location within the game reserve – meaning you get the best views of wildlife, and you still feel like you’re staying in the wild, even with top class accommodation like en-suite bathrooms, air-conditioning, stylish décor, and often luxurious extras like plunge pools and private decks to watch the sunset. Luxury tented lodges and camps offer a similar experience, but they are obviously less permanent structures, offering a more authentic experience of ‘camping under the stars’ beneath canvas. For a more exclusive luxury safari experience, try a private safari lodge. On private or leased land, these small, intimate lodges can offer more extensive game drives, as they aren’t limited to driving within the roads of a national park. You can often go on walking safaris with private guides, and get up close with the animals. Private safari lodges offer a superior level of services for guests, such as a laundry service, all-inclusive drinks and exclusive access to wildlife that other tourists don’t have. Safari Houses are also an increasingly popular option with luxury travellers. Originating in Zambia, Safari houses have now spread to other African Safari destinations. Built in the middle of the bush, Safari Houses accommodate a large group of people and promise spacious communal areas, scenic private views and swimming pools. Some are even built on the beach! In South Africa, the private houses in the Waterberg Mountains, close to Johannesberg allow guests to explore the African bush away from big cats, predators and malaria. Taking only one booking at a time, these properties are perfect for families looking for a premium safari experience. The larger, more famous safari destinations like Masai Mara in Kenya also have luxury and boutique hotels outside the national park. The Fairmont chain of hotels has some luxury safari properties, and smaller boutique properties are even closer to the action, like Amara Selous, which is actually located on Selous Game Reserve, Tanzania. The facilities vary across different types of luxury safari property, but you can expect an exceptional standard throughout. Private campsites are slightly ‘rougher’ – although the tents are large and the camp beds comfy, you’ll still have to use a bucket shower and a bush toilet. Whilst in the lodges houses and hotels, you’ll have ensuite bathrooms, flushing toilets and hot running water. What really makes luxury safari accommodation stand out, however, are the facilities. These can range from a swimming pool and sun deck, private veranda overlooking a watering hole or lake, to hot tub, gym, private dining rooms or chefs, laundry service, a well-stocked bar and restaurant, serving fresh, local produce and picnics to take on game drives. Many of the luxury lodges and camps will offer a range of activities, from nature walks with a local guide or wildlife expert, to bush dinners, night-time game drives, balloon safaris, birding and frog safaris, interpretive bush walks, walking safaris and evening entertainment. Most of the major African safari destinations now have a luxury option, be it private tented camps or well-equipped lodges. For pure, unadulterated luxury, South Africa leads the way with luxurious lodges like Royal Malewane, Singita, and Londolozi on the best private game reserves in Kruger National Park. Many of the reserves are also malaria free, a major draw for many travellers. The Eastern Cape has some top family-friendly accommodation that’s still remarkably luxurious. Traditional safari hot-spots like Kenya and Tanzania have more variety of luxury accommodation, ranging from the plush tented camps such as Mara Bushtops in Kenya to the stately manor houses and even treehouses, like Lake Manyara Tree Lodge in Tanzania. Zambia’s famous private Safari Houses, staffed with house manager, private chef and waiters are perfect for those wanting a more exclusive, self-drive experience. Less popular, but still excellent safari destinations such as Botswana and Namibia are also worth a look for their vast, untouched wilderness and lack of crowds. Both have a wide range of safari lodges and tented camps. Little Ongava is one of the most luxurious safari lodges in Namibia, located on the private Ongava Game Reserve by Etosha National Park. 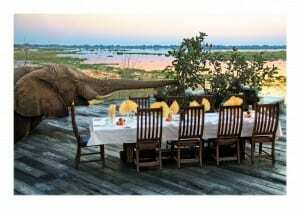 In Botswana, the Sanctuary group of lodges and camps offer the most luxurious safaris in the area. Sanctuary Chobe Chilwero Lodge, in the heart of the Moremi Game Reserve (the “predator capital of Africa”) sleeps guests in 12 luxury raised pavilions, and even has its own spa.